I love a couple things about catfishing. First, you never know what you are going to pull up. It could be a 2 lb catfish one moment and a 50+lb cat the next. The variation in sizes is amazing. Most species don’t seem to have that much diversity in size. But catfishing leaves you constantly imagining what may be lurking out in front of your rods. The second thing I love about catfishing is how relaxing it is. I grew up fishing for salmon, trout, char and grayling in Alaska. We would stay up all night fly fishing for sockeyes on the Kenai river with the midnight sun going gang-busters overhead. That is fun, but relaxing it is not. You arms are sore, your back screams, you feet go numb, your fingers stop working. 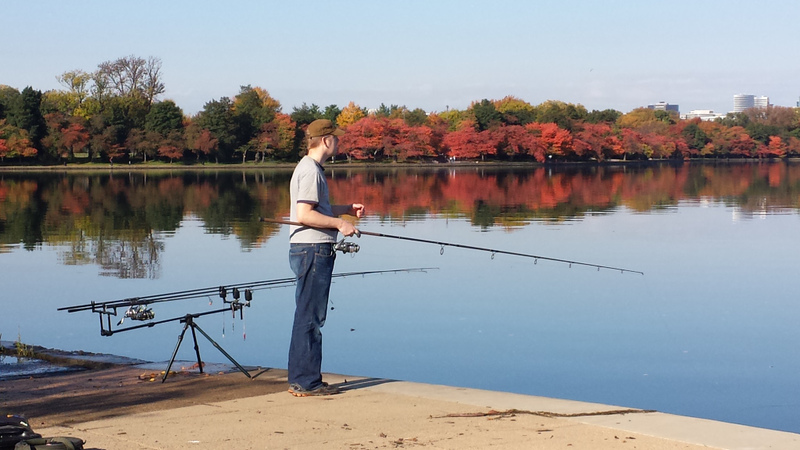 A beautiful day catfishing with my usual three rod set up on bit alarms. All night catfishing means sitting in your tent by your rods, frying eggs and bacon on a skillet in between reeling in fish. Sleeping in a soft cot, and only waking up when your bite alarms are screaming. Sitting in a soft camping chair by my rods enjoying nature with my family is the best thing in the world. Whether you are a novice or a seasoned catfishing expert there is something in this website for you. Catfishing equipment, catfishing tactics, catfishing baits, catfishing rigs…we got it all. If there is something you want to know about and you don’t see it here, then contact us an let us know and we’ll blog about it. We want nothing more than to help you have more fun and cat more fish. For more videos and catfishing tips check out our catfish and carp Youtube channel.